Socking it to audiences — "A tough, trench-coated detective investigates a mysterious disappearance and an alluring femme fetale in a city on a wartime footing. The Lady from Sockholm unspools familiar plot threads from film noir, only the 70-minute feature is entirely populated by sock puppets." Red Schtick Mag Review of The Lady from Sockholm — "more than chuckle-funny... I like this movie, because it introduced me to the bold world of sock witticisms and hosiery puns." The Lady from Sockholm Review — "As good a crime story as it is silly fun. Keeping the zaniness in check are period-perfect compositions, lighting, and clever set dressing." The Lady from Sockholm Now on DVD — "Beautifully photographed. Shadowy mood lighting and shallow focus help re-create the film noir look and feeling of 1940's detective films." Mmmmm ... movies — "You know how you're mysteriously always losing one sock in the wash? This film might provide some answers." Selected as Metromix's #1 "Choice Feature." Metromix Movie Review - The Lady from Sockholm — "Sockholm is a lot of fun ... But don't be fooled. 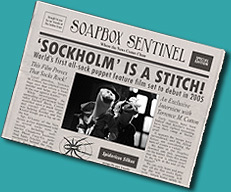 The Lady from Sockholm is much more than carefully crafted sock puns." Cinemagic World Screen Festival 2005 — "A little bit of cinema history...(an) amusing mystery"
Good Day Alabama Television Interview (10.1 mg) — "A great movie"
Best of the Fest — "should do for cinematic puppetry what Toy Story did for computer animation"
24 films featured at festival in Tipton — "a high-quality film ... brilliant sets and lighting"
Socks cover the soul of Hardacre — "takes the film noir genre and jumps in with both feet"
Columbus Alive Review of The Lady from Sockholm — "terrific use of the genre’s heightened visual style"
Film Threat Review of The Lady from Sockholm — "as tense as any film featuring human actors"
She Made It — "an immensely intricate piece of cinematic art using the least likely of media ... an amazing achievement." "one punny movie ... entertaining for kids, but chock full of witty humor for the adults to enjoy all on their own." Start with a great story... before there was a movie, the screenplay for The Lady from Sockholm was recognized by several prestigious screenwriting organizations. Please see the contact section to request a press kit or to schedule an interview with a member of the cast or filmmaking team. Hi-res photos can be dowloaded from this site. Click here to view the print quality photos available for publication.